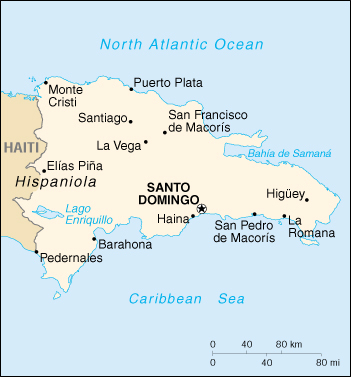 Location:	Caribbean, eastern two-thirds of the island of Hispaniola, between the Caribbean Sea and the North Atlantic Ocean, east of Haiti. Geographic coordinates:	19 00 N, 70 40 W.
Map references:	Central America and the Caribbean. Area:	total: 48,730 sq km land: 48,380 sq km water: 350 sq km.